Custom Built Contemporary tucked on 5 private acres! Wide open spaces welcome you! Custom contemporary offers sunny and handsome open floor plan featuring 2 story glass views of southern woods, cherry floors & cabinetry milled from the land. Master suite on first floor, two more beds & bath up; 4th w/showered bath on walkout basement level. 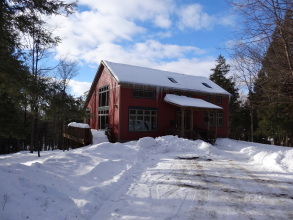 Super Barn w/2 garage entry's and plenty of storage, small animal space within. A great home on a pretty setting. A few miles from town, Colgate University. Best of both worlds!